Thirty-nine percent of Metro’s workforce will be eligible for retirement over the next three years, which illustrates the need to create and maintain a qualified workforce. In Los Angeles County one year ago, voters gave our transportation revolution a resounding vote of confidence by supporting the Measure M sales tax ballot measure with 71% of the vote. Measure M will bring to our region 40 major transportation projects in 40 years. It will change the face of Southern California and will help us create an infrastructure inheritance for our children and grandchildren. It’s about time. The U.S. has been on an infrastructure vacation for decades and the effects are becoming increasingly obvious. Measure M is projected to generate 778,000 jobs over the next 40 years. But just when we need them the most, baby boomers are retiring. Thirty-nine percent of Metro’s workforce will be eligible for retirement over the next three years and 69% of Metro employees are over the age of 40. These numbers illustrate the need to create and maintain a qualified workforce. But how do we do that? The Los Angeles County Metropolitan Transportation Authority (Metro) employs more than 10,000 individuals to operate the third busiest transportation agency in the U.S. Even before Measure M, Metro had a critical need for trained workers. That is why we have set out to develop a multi-level program to help us attract, develop and retain employees. We created what we call Metro’s Career Pathways Program. This is not simply a new workforce model. It’s a shift in how Metro and the industry prepare the next generation for work and lifelong learning. The goal is to reorient existing education and target individuals in need of education, training and workforce services. There are many challenges. We must prepare job candidates for hard-to-fill positions. And we need better collaboration with at-risk youth. Only 45% of foster youths in L.A. County graduate from high school, compared with 79% of the general student population. We want to change this. Part of our vision is to establish a state-of-the-art vocational and college preparatory boarding school for 6th through 12th grades, with students recruited from the Department of Children and Family Services, probation, the child welfare system and surrounding communities. We want to establish the school as the entry point for the industry and Metro’s Career Pathways Program, which begins the path to skilled transportation jobs. With that in mind this summer we launched WIN-LA — a groundbreaking Workforce Initiative Now program to put people to work, provide support services and have folks work on our projects here in L.A. County. WIN-LA is innovative in part because it has wraparound services, such as day-care referrals, that can be particularly helpful to lower socioeconomic residents in disadvantaged communities. It’s not always enough to just provide a job or training. 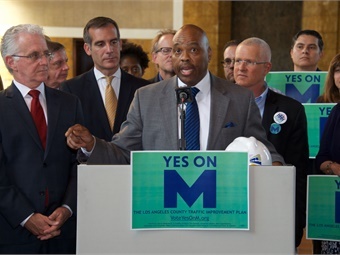 Measure M will bring the L.A. region 40 transportation projects in 40 years, according to Metro CEO Phil Washington (shown speaking at a press event). But WIN-LA is not a social program. It’s an economic development program that allows people to work, build careers and contribute to society. They will pay taxes and buy goods. They will contribute to our local economy. And this will improve the quality of life for our entire region. Providing training and jobs for people — jobs that will help them rise out of poverty and into the middle class — is an honor and a privilege and one that has the potential to change our region and, perhaps, our nation. Within Metro, we are also working to train and inspire. To prepare the next generation of transportation leaders we are continuing a series of programs, including the Multiple Agency Exchange Program (MAX). In partnership with Denver Regional Transportation District, Dallas Area Rapid Transit (DART) and Metropolitan Atlanta Rapid Transit Authority (MARTA), MAX offers formal leadership and learning development to employees who are potential leaders in the transportation field. And, in 2018, the program will be expanded by adding Sound Transit (Seattle) and Valley Metro (Phoenix). 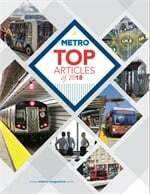 Additionally, we are reinforcing Metro’s reputation as an employer of choice through the Metro Leadership Academy (MLA). We graduated 40 employees in the first year and we initiated the second year by welcoming 40 new students. Our MLA program provides the opportunity for employees to advance their personal leadership philosophy, develop an understanding of public transportation and acquire a deeper view of what it takes to lead at Metro and throughout the transportation industry. With programs like this, Metro fosters a learning environment and encourages networking to make collaboration across the agency easier. To expose our employees to current industry trends, Metro also participates in external partnerships with leading industry professional organizations, including the American Public Transportation Association, the Eno Center for Transportation and the Conference of Minority Transportation Officials. This summer we formed a volunteer Women & Girls Governing Council to discuss how Metro programs, services and policies impact the lives of women and girls in Los Angeles County. What we know is that 51% of L.A. County residents are women and girls and that L.A. County women under 35 graduate from high school and attain post-secondary degrees at significantly higher rates than both their male peers and women over the age of 35. And yet, women and girls suffer from disproportionate disadvantages and burdens, such as poverty, violent crime and lack of workforce parity. We also know that women make up a third of L.A. County’s homeless population. The council will examine Metro policies and programs with the goal of advancing women’s leadership, eliminating barriers to women’s employment and create opportunities for women and girls to succeed. As part of our commitment to our employees and the communities we serve, it is our obligation to create an environment in which our workforce is the most important asset we have. At Metro we talk about leaving an infrastructure inheritance for future generations. By that we mean leaving trains, buses and highways in good working order. We don’t want to leave future generations with crumbling bridges, streets and rail lines. We do want to leave them with a mobility network that has been well planned and maintained and is in fighting shape 100 years from now. But that inheritance must also include training for good paying jobs for current and future employees. The challenge for all of us at Metro — and elsewhere — is to embrace the future. Be bold and innovative. And invest wisely in educating the next generation of employees. With that accomplished, we will continue to benefit from the best employees in the industry.